Psalm 100:4-5 (NIV) - Enter his gates with thanksgiving and his courts with praise; give thanks to him and praise his name. For the Lord is good and his love endures forever; his faithfulness continues through all generations. Taking Care of Me: Where are my pants/jeans/skirt?/Take off your pants/jeans/skirt? ABC Book: The Xylophone worksheet contains 8 rounded rectangles. Paint each rectangle a different color: red, orange, yellow, green, blue, purple, brown, and white. Help the child use long, smooth paint strokes. 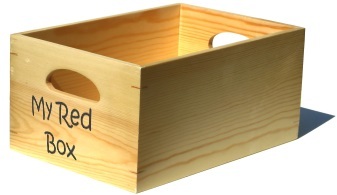 Color Box - Walk through your home or classroom and collect white items to place in a container. 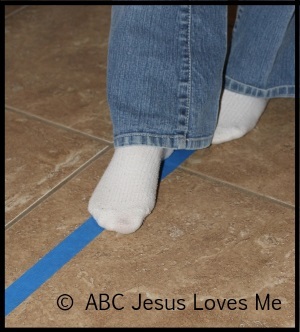 Shape Walk: Use pieces of painter's tape or sidewalk chalk to make a large rectangle on the ground. Assist the child in walking, crawling, and hopping around the edges as you sing the shape song. Note: Do not use masking tape on carpet, as it will leave a residue. - Spread a thin layer of glue on the Dinosaur worksheet. Using white uncooked pasta, glue "bones" on the dinosaur. - Find pictures of dinos in the books that you read. - Author Jane Yolen has many great dino books in her How Do Dinosaurs series. To help the child be successful in taking off pants, partially remove the pants by pulling them over the hips and then allow the child to sit down and remove them the rest of the way. - Sign "sleep" when you come to the illustration of the sleeping dinosaur. - Point out that the door is a rectangle. - Look for white objects in the illustrations. Bubble Fun - Blow bubbles and encourage the child to catch, step on, and pop the bubbles as they float to the ground. Bubbles are fun in the bathtub too (make sure the child is sitting down).